In 2015 I went for a great photowalk with Trey Ratcliff in Chicago. Before that photowalk started though I went for a short sight seeing tour on my own. 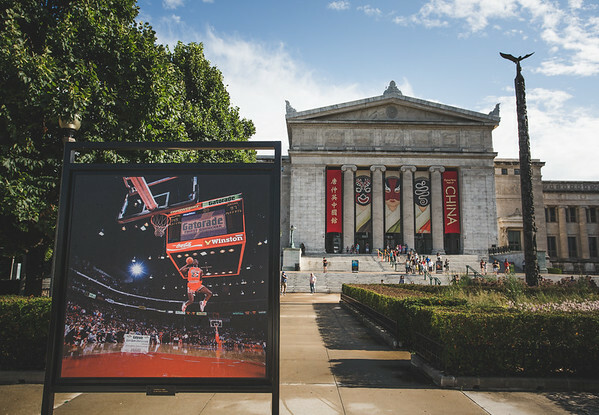 I had wanted to see this Michael Jordan art installation in front of the Field Museum for quite some time, but never found the time to head up to Chicago to see it. The photos of Jordan were made by iconic photographer Walter Iooss. It was a great walk down memory lane seeing all of the Jordan photos again, and it was also a good way to explore a new part of Chicago that I had not been to in a while. I love looking through the sports photos of the great photographers. They have a way of telling the story through their photos. Photographers like Walter Iooss Jr. did some amazing things with the equipment that they had at the time. A walk like this through his best Michael Jordan images really brings that home.